RVnGO is America's best marketplace to find RVs to rent in New Mexico. Find your RVnGO! A state gem, Carlsbad Caverns National Park is a filled with beauty and wonder both above and below. More than 119 caves are hidden beneath the surface, you can learn about the park with a guided ranger talk or tour at your own pace. Access is available by elevator or hiking. Be sure to catch the sunset flight of the bats, which begins in May and runs through the summer months. Open year-round except for on Christmas Day, this is a geological must see! RVers going in their RV rentals in New Mexico to Albuquerque will want to make a stop at the Petroglyph National Monument. One of the largest sites of its kind in North American, these ancient pictograms reflect designs and symbols of the Native American and Spanish settlers from 400 to 700 years ago. The images are carved into volcanic rocks and hold a profound spirituality for Native Americans. There are four hiking trails in the monument from which to view these archeological treasures, they range in length from one hour onwards. In the northern Chihuahuan Desert of New Mexico, a dramatic landscape of rippling rare white gypsum sand dunes captivates the eyes for more than 250 square miles. The White Sands National Monument has a few walking trails with interpretive exhibits on wildlife from which to bask in the scenery or there is a 16-mile looped road called Dunes Drive to explore via car or bicycle. The more adventurous can hike up the dunes and take an exhilarating ride down on a sled. Close to Santa Fe, nestled among the pion, juniper and ponderosa pine woodlands of the Sangre de Cristo Mountains you will find Pecos National Historical Park. Notable for the remains of Indian pueblos (mud made residences) which date back a thousand years, guests are invited to explore the culture and rich history of the Pecos Valley. In addition, there is hiking, fishing, and guided tours with artifacts from the peoples who once inhabited the area. Do you know the way to Santa Fe Skies RV Park? Its minutes from the various attractions, eating choices, and business corridor of Santa Fe, New Mexico and a great place to stay to explore the area. It has 98 accessible spaces, 96 of which are full hookups with tables, porches, and space for slideouts. Service includes a game room, recreational hall, nature trails, exercise classes, RV supplies, nearby RV benefit restrooms, and showers, laundry area, and wi-fi web access for your camper rental New Mexico. Make the most of its quiet setting all through the year. Perfect for a travel trailer rental in New Mexico, the Stagecoach Stop RV Park is a choice stop to dock at and explore the urban communities of Rio Rancho, Albuquerque, and its encompassing territories. It has 40 accessible full hookups with space for slideouts. Its services include a heated pool, whirlpool, game room, recreational hall, wi-fi, digital TV, RV stockpiling, restrooms and showers, and laundry area. The Stagecoach Stop RV Park is open any time of year for your travel trailer rental in New Mexico! 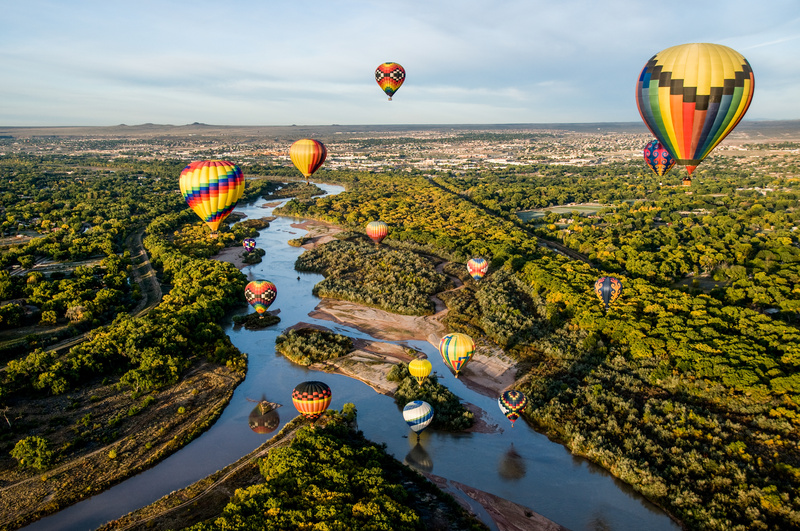 Generally held the second week of October, the Albuquerque International Balloon Fiesta is a nine-day colorful feast for the eyes. The worlds largest ballooning event started in 1972 and hosts 600 inflatables, musical performances, daily inflatable glows, flying competitions, firework shows, a balloon gallery, arts & crafts stalls, chainsaw carving competition, wandering entertainers, food and drinks, and a ton more. Best of all you can stay in the RV on site (book early, reservations required), so bring the whole family and be hypnotized by the Albuquerque International Balloon Fiesta! A three-day occasion held each July, the Taos Pueblo Pow Wow Festival is a cultural rich event that preserves Native American ceremonial heritage. A gathering of Indian nations, the powwow invites tribes throughout the country to come together in a circle of friendship, to connect in song, dance, and trading. It is a competition of tribal dances for women and men, that is divided by age group and dance style. A spectacular performance to behold, the beat of the drums will beckon you to move along. The festival will also tempt you with artistic wares of jewelry, beadwork, pottery, paintings and more specialties sellers. The celebration held at the Taos Indian Reservation has a variety of food to enjoy and is a liquor and medication free occasion. New Mexico, filled with the amazing natural landscape, points of interest and cultural to behold, will more than enchant you. Book an RV rental to New Mexico at RVnGO to make New Mexico part of your own history. Much thanks to you for picking RVnGO for your RV rental in New Mexico!